Borinquen Gallo, Deadly Poppy Field, 2016. Burning in Water is pleased to present Borinquen Gallo: Like a Jungle Orchid for a Lovestruck Bee. 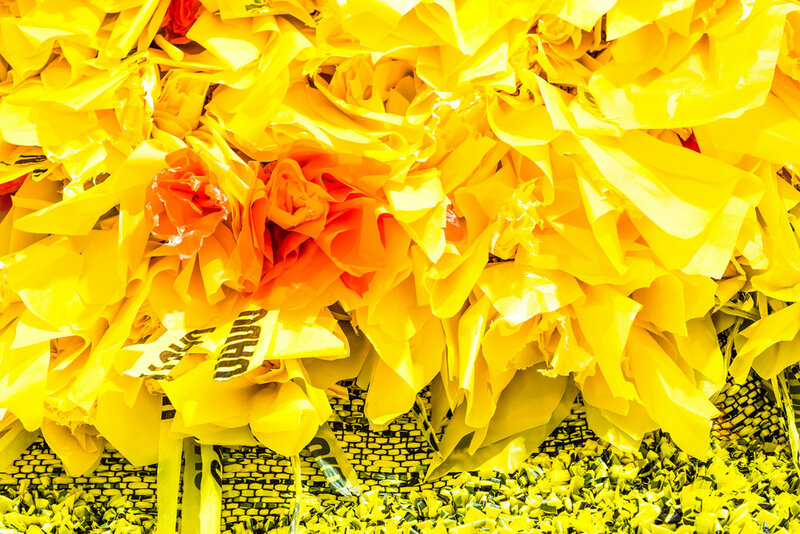 The exhibition features a series of sculptures and a large-scale, immersive installation fashioned from intricately reconstituted street materials, such as yellow and red “caution” tape, construction tarps, garbage bags, discarded hub-caps and debris netting. The show is the inaugural solo exhibition of the artist’s work in New York. Born in Rome to a Puerto Rican mother and an Italian father, Gallo subsequently spent her formative years living in the Bronx, where she continues to reside and maintains her studio. She trained as a painter, but later gravitated towards the use of unorthodox materials reflective of her local environs. Despite their genesis in humble, disposable materials, Gallo’s totemic sculptures entail soaring, flourishing gestures reminiscent of the classical art and architectural influences to which she was broadly exposed as a child. The works also yield a sense of meditative contemplation and a yearning toward transcendence. Borinquen Gallo: Like a Jungle Orchid for a Lovestruck Bee is on view through November 18 at 317 10th Avenue, New York City. Borinquen Gallo (b. 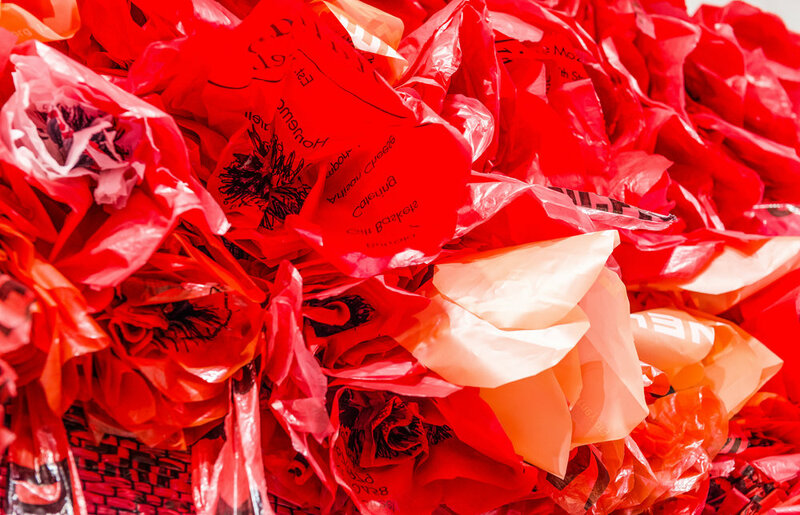 1975, Rome) is a Bronx-based artist whose work delves into themes of beauty, community and purpose through sculpture and large installations. Previous exhibition venues include The National Academy Museum, the Bronx Museum of the Arts, the Queens Museum, Columbia University, The Cooper Union and Queens College. Gallo received her BFA in Painting and Sculpture from The Cooper Union for The Advancement of Science and Art her MFA in Painting from Hunter College. She has received numerous distinctions including the Sol Shaviro Award (2015), the Marion Netter Fellowship (2010) and the Doris Liebowitz Art Educator Award (2009). She has completed residencies at The Vermont Studio Center and The Cooper Union. In addition, she has worked on curatorial projects with BAM, Fisher and the Pratt Institute. Gallo is currently Assistant Professor of Art and Design Education at Pratt Institute in New York.